In the first part of a new series on buying timber, I will start by looking at the different methods for sourcing timber and ways in which timber can be converted. 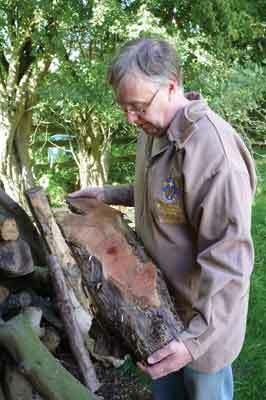 I have sourced my timber for over 30 years, using sources such as tree surgeons and woodturning suppliers. Knowing where to look and where to buy your timber from is a learning process that can take years to master; I know as I have been there and yes, I have made mistakes along the way. Making contacts and letting them know what you are looking for is time well spent. All us woodturners have to buy or source timber; how we go about this can be broken down into the number of turned items we produce each year. Also, how much money we want to spend, or are allowed to spend, and what space we have to store the timber, what we are turning and the time scale available, are also important factors to consider. 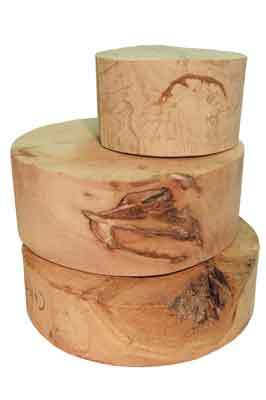 The simplest way to purchase blanks is from a woodturning supply shop. This way you can walk into the wood store and look at the rows of blanks, but do have in mind how much you want to spend. These stores can seem like an Aladdin's cave. 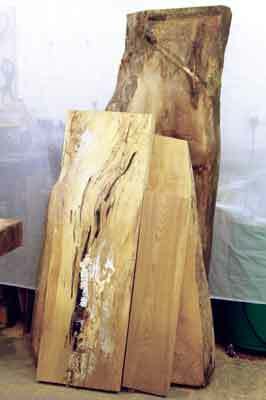 The wood blanks will be organised according to size and species. The blanks will be marked with the price and sometimes the size. I always take a tape measure with me to size the blanks. You may also find A/D on the blank which means that the blank is air dried; this may be around 18% to 30% moisture content. P/S indicates that the blank is only part seasoned and therefore the moisture is unknown. 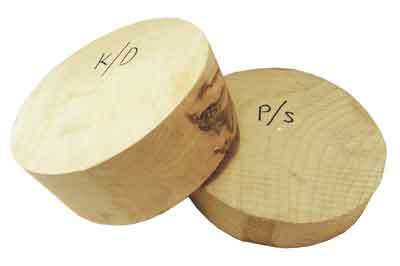 Lastly, K/D means that the blank has been kiln dried, which means that it should have a moisture content of around 10%. 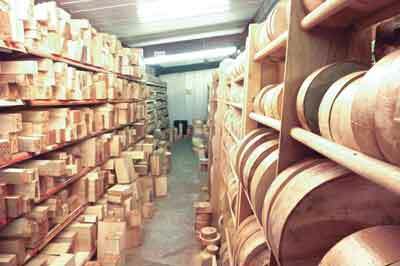 Most woodturning supply stores will stock planks in various sizes; this is a more economical way to buy timber and gives you the choice of cutting the plank up as you want, but it also enables you to use the best features in the timber. 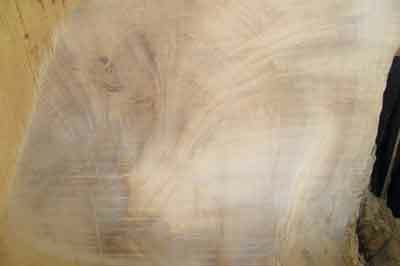 I am lucky that Snainton Woodworking Supplies is only 18 miles away; they have a very large stock of timber and will give you all the help you need. I have been going for years now and know the family. They run a scheme where you pay a membership fee and receive a discount on all timber purchases. Look in your local area for a supplier - you are sure to find one. Mail order is another method; this is good if you know that you will receive what you asked for. 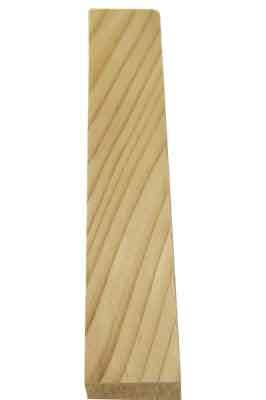 Woodworking shows are a good source of timber as well as finding a wood store not too far from where you live. One point to bear in mind is that if you see a nice piece of timber and think you will go back for it later, don't be surprised if it's gone when you return later; you will not be alone in spotting a nice piece. 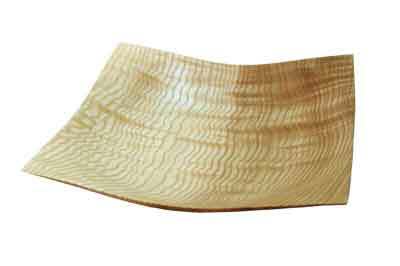 When I went to the Harrogate woodworking show, there was a piece of fantastic quilted ash (Fraxinus excelsior) on a stand, but as soon as the word got out, people were like bees around a honey pot. 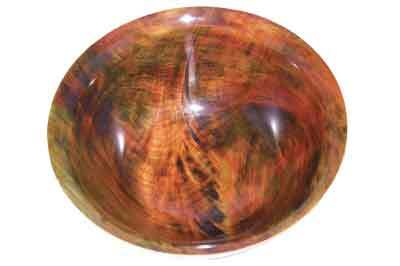 Ask your local woodturning club where they buy their timber from; you can't beat a recommendation from other woodturners. Some clubs may ask the members what they need and go to buy in bulk to get a discount from suppliers. 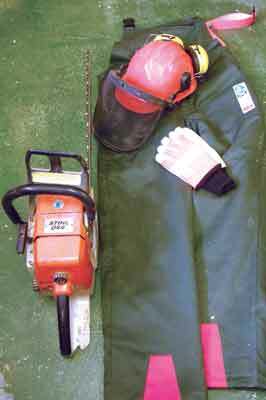 If you use a large quantity of timber then sawmills may be the place to look, but this will also require more equipment in the workshop to convert your timber, such as a chainsaw and safety equipment. I have bought an expensive chainsaw, but this is just one piece of equipment you can't do without. 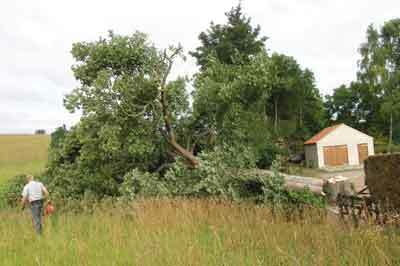 You may need training in the use of a chainsaw, not forgetting that if you leave your own property, you will need insurance and a certificate, or pay the consequence if things go wrong. Tree surgeons can be found in your local area. A tree surgeon will cut down trees of all sizes from a small fruit tree in a garden to a sycamore (Acer pseudoplatanus) tree standing 15 metres, or around 50 feet tall or more. 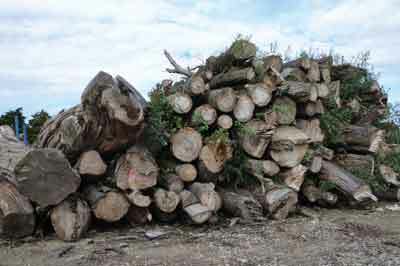 Be prepared to take the tree away from where the tree surgeon is working with a suitable vehicle, and remember that a cubic foot of timber can weigh 35lb per cubic foot when dry depending on the species, so a newly felled tree will weigh a lot more. I went along with a friend, Mick Wall, who is a tree surgeon from Burythorpe, or as he prefers to be called, a 'timber contractor,' to see a sycamore being felled. This was around 120 years old and about 55 feet tall; he estimated the tree to weigh about 6 tons. You will also be surprised how large a tree is when it is felled and lying on the ground. He forgot to tell me that I would have to help move the branches to get my car out, thanks Mick, but with his skill my car remained untouched. 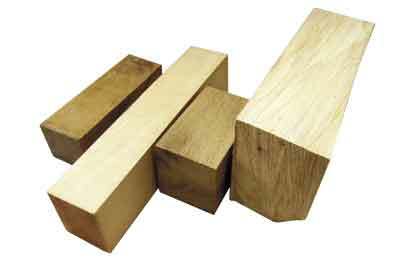 If you only use a small amount of timber and turn small items then turning blanks and square lengths are the best option for cost; if you decide to move on to buying planks then you will have to look at having a bandsaw in your workshop to convert the timber into bowl blanks. Does the saving justify buying a bandsaw? Only you know the answer to this, but the bandsaw is the best saw for a woodturner and will come in handy for many other jobs in your workshop, but do make sure it has the power to cut the size of blank you wish to turn. Knowing where to buy is the first step but knowing what to buy is just, if not more, important. If you turn for a hobby then buying a blank that is smaller than you intended is not a problem, but if you are turning for a commission then the size, grain direction, markings and any faults, such as knots, on the edge or splits are important, as well as moisture content. Considering what the timber is going to be used for will help with your choice; if you are intending to colour the turned item then a bland piece is best to use here, especially if you intend to use a coloured design, as in block colours or more intricate patterns. Careful use of colouring of timber with strong grain patterns can bring the grain to life; this could be a problem if you are colour blind, but you will be guaranteed something unusual. If you intend to pierce the item then knots will only cause problems. If the turned item is going to be used for a handle or a support then you will need the grain to run straight down the length, not across or diagonal, as this will be very weak and may well break. Remember that all timber will move when cut due to the stress in the timber; the way to overcome this is to part turn and leave for a few days before returning to the lathe to complete. Movement can be a problem; for example, a box with a lid.